The gardening season in the Midwest is how I thought gardening everywhere worked. I plant my seeds indoors in February, wait for the last frost in May (sometimes until the end of May) to plant the vegetables outside, grow everything and hope that the longer growing plants like tomatoes can finish their growth before the first frost (which isn’t always likely). By mid-October, everything has been harvested, and it’s another seven cold months before the process can start again. This summer we moved to Tucson, Arizona, and I learned that growing a garden in the desert is nothing like growing a garden in the Midwest. Everything is grown in a different season. A fall garden can be planted in early October, and that garden can produce most of the winter as long as it’s protected from frost and the occasional freeze. Seeds for the spring garden are planted indoors in December. The garden is planted in February. 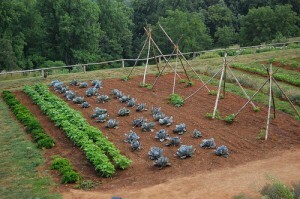 By June, the harvest is over and the garden remains dormant through the brutal summer days. Everything I know about gardening is nearly worthless in this location. I have to start learning all over again. Thankfully, I’ve found several resources to help me understand gardening in this new climate. Yes, Facebook is good for more than just social sharing and catching up with family and friends. I found a Facebook group for gardening in Tucson. I’ve learned so much in the last few months here! People share their gardening techniques as well as stories of predators to watch for. (I’ve seen more pictures of bugs, worms, and caterpillars on plants than I can count.) There are javelinas here (a bit like wild pigs) that will dig through your garden if you don’t have a secure fence. If your garden attracts mice and rabbits, you may soon have to contend with snakes and rattlesnakes. In addition, this group is great about answering questions for newbies like me. I thought I’d plant squash in my fall garden until the group let me know what grows when in Tucson. Turns out squash need to grow in February here. Several of the local gardening companies are also members of this group, and they happily share their expertise. There are several gardening companies here that regularly host free gardening classes and cover topics ranging from what to plant when, to irrigation, to planting fruit trees. I haven’t taken advantage of these classes yet, but I plan to if my fall garden fails this year. One reason why I haven’t attended the local gardening classes, the nearest of which is nearly an hour away, is because I’ve found so much educational material online. I simply searched by our county’s name and found information galore about how to prepare the soil as well as a gardening schedule and calendar. There are plenty of YouTube videos that individuals and local groups have posted explaining the unique challenges of gardening in the desert. One of the best ones I watched was produced by the local Arizona food bank. The 12 minute video explained how to chose your garden location, how to create a drip irrigation watering system, how to prepare the soil (including using a jackhammer to turn up the hard desert soil), as well as what to plant when. If you’d like to try your hand at gardening and are a complete newbie, or if, like me, you moved to a new location where everything you know will only hurt your gardening endeavors, these resources can help get you up and gardening in no time. What’s your favorite gardening resource? Have you ever taken advantage of the resources listed above? I’d love to have my own garden if I lived in the countryside. I think I’d get some chickens too. For now I’ll stick to herbs on the windowsill. It’s not much, but it’s a start.